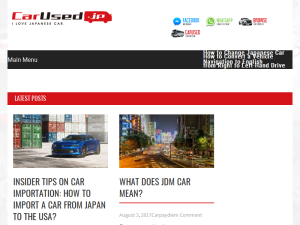 Blog Description: Carused is a car exporting company expert in Japanese second hand cars, trucks, and commercial vehicles. We are exporting more than 400 used cars all around the world monthly for over 10 years. We are recognized as one of the most competent vehicle exporters in East Asia. Our giant inventory consists of minibuses, namely Hiace, Bongo, Townace, trucks like Fighter, Dyna, Canter, and buses including Rosa, Coaster, and even more. Futhermore, we provide an exclusive access to Japanese vehicle auctions which let you bid second hand cars with our expertise. Struggled with importing vehicles from the Japanese market? Bored of searching for second hand cars on the web hurricane? Carpaydiem is happy to support you to find & import budget-friendly, quality controlled used cars with our staffs.